Indianapolis, here we come! 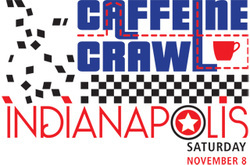 Fall of 2012, Indy hosted its first Caffeine Crawl, with 7 businesses participating. This year on Saturday, November 8th, our lineus has 11 shops and roasters participation. From Downtown to Carmel, each shop will showcase its unique skills as we celebrate the best in the industry. 3 different transportation options - 2 biking routes, 2 driving routes, and a bus routes - will all be led by a guide, and each route has 6 total stops providing a short, educational presentation and delicious sample. With a wide variety of participants, from award-winning coffee roasters to brand-new shops, to chocolatiers and doughnut shops, we expect each route to be unique and engaging. The event will start at 10:00a and end at 2:30p with an After Party to follow, hosted by Julian Coffee. Average early November temps in the 50s and sweater weather in Indy will make for ideal coffee-drinking weather. And don’t worry, Colts fans! It’s a bye week and we’ll finish before the Pacers tip off. Join us for the biggest coffee event in the state of Indiana while you meet the baristas, roasters, and owners behind your favorite drinks and improve your coffee and chocolate knowledge in the process!